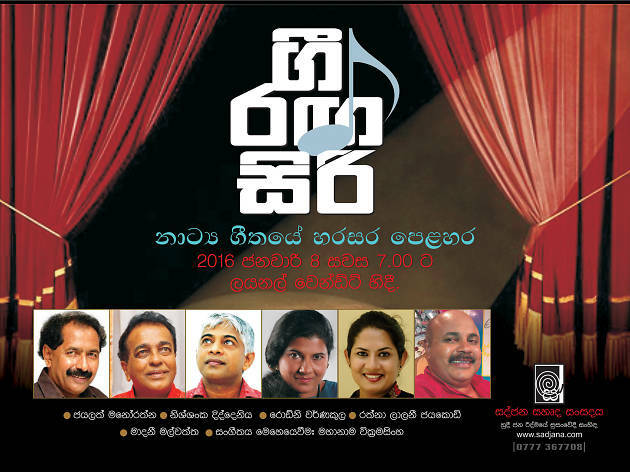 From John De Silva’s 'siri sanga bo' staged in 1903 to Jayalath Manorathna’s drama 'Guru Tharuwa' the duration spans over hundred years. 'Gee raga siri' presents the popular drama songs in the period providing a rare opportunity for people to listen to them and learn the evolution of the stage drama during the period. 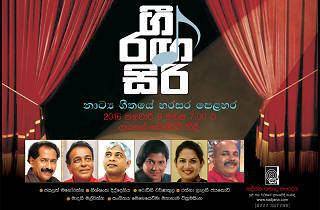 The songs from historic dramas songs such as Ada wessanthrara , shantha johnge , maha giri damba, ha ha lande, dekkoth pathmawathi, siri sanga bodi, gin gan guly will be sung by veterans in the field like Jayalath Manorathna Nishshanka Diddeniya, Rodney Warnakula, Rathna Lalani, Madanee Malwatta and music will be done by Mahanama wickramasinghe. Priyankara De Silva serves as the organizer and the coordinator.